If you read the headlines, Donald Trump’s election has killed the Trans-Pacific Partnership (TPP). The headlines have it wrong. Donald Trump didn’t kill the TPP. Assuming we see the fight through to the bitter end, it’s the cross-border, cross-sector, progressive “movement of movements” that will have defeated the TPP. While overshadowed by the horror of Trump’s election, this victory will be one of the biggest wins against concentrated corporate power in our lifetimes, and it holds lessons we should internalize as we steel ourselves for the many challenges we face heading into the Trump years. Under a banner reading “A New Deal or No Deal,” the first cross-sector demonstration against the TPP in the United States was in June 2010 — a full six years before Trump became the official Republican nominee. 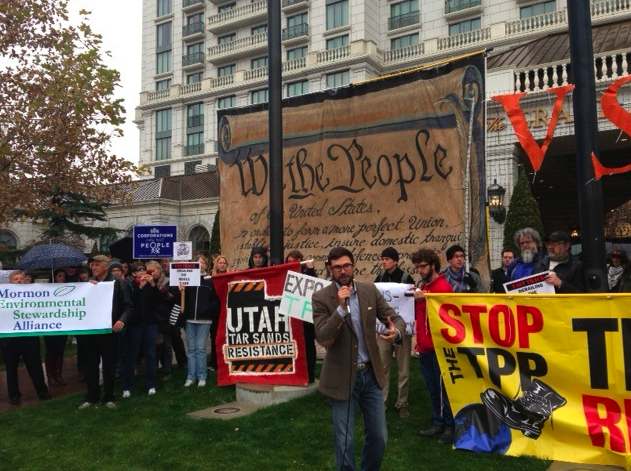 Held outside the TPP’s first U.S.-based negotiating round, it featured advocates from the labor, environmental, family farm, consumer, indigenous rights and other social justice movements. While we didn’t outright oppose the TPP at that time, we warned we would organize against it if it didn’t represent a radical departure from trade deals past that put corporate interests ahead of working families, public health and the environment. It took years of protests at subsequent rounds in Chicago, Dallas, San Diego, Salt Lake City, Maui and elsewhere — coupled with hundreds of other protests in cities and towns across the U.S. and around the world — to slowly, but surely, put the TPP on progressive groups’ radar. Over that time, first thousands, then tens of thousands, then hundreds of thousands and then literally millions of Americans signed letters and petitions urging the Obama administration and Congress to abandon TPP negotiations that gave corporate lobbyists a seat at the table, while keeping the public in the dark. We were up against Wall Street, Big Ag, Big Oil, Big Pharma, the Chamber of Commerce, the Business Roundtable, the President of the United States, the leadership of Congress — in short, we were up against some of the most powerful economic and political interests in human history. Countless people told us we had no chance of winning. But we persevered. Our allies abroad did yeoman’s work convincing their governments to reject the most draconian proposals from U.S. negotiators — something that dragged out the negotiations for years, giving us all more time to organize. Together, globally-coordinated progressive coalitions from a host of different countries developed and publicized analyses of the TPP, pushing out leaked texts when our governments refused to tell us what they were proposing in our names, and hacking away week after week against media blackouts, relying heavily on independent media, social media and word-of-mouth to inform the most active elements of the public about the power grab underway. In the U.S., after reaching out to groups one at a time to pull them into this fight, more than 2,000 organizations had signed statements opposing “fast track” for the TPP by April 2015. This, again, was before Trump had even announced his candidacy. An incredibly diverse array of organizations and individual activists were constantly sharing information and strategically coordinating their efforts to pressure key elected officials, such that we built a majority of opposition to the TPP in Congress — despite all the big-money interests fighting hard on the other side. Check the timeline here. The TPP negotiations concluded in October 2015. The pact could have — and absolutely would have—been approved by Congress as early as February 2016 if the votes were there to pass it. Progressives’ work ensured the votes weren’t there. Keep in mind that there were still twelve major Republican nominees competing for President at that time, with Jeb Bush one of the favorites. Donald Trump had nothing to do with it. Progressives stopped the thing then, and we pushed a threatened vote back week by week, month by month, until Congress broke for the summer recess. We knew a last-gasp attempt to pass the TPP might come post-election during the “Lame Duck” session of Congress, but we already had the votes lined up and were poised to defeat it should the administration dare bring it forward, regardless of whether Donald Trump, Hillary Clinton, Bernie Sanders or anyone else was elected to the White House. We must remain vigilant to ensure there are no last-second surprises before the end of the year, but for now, it appears the White House has seen the writing on the wall, and has given up trying to finalize the TPP. Let’s make sure we’re not letting Trump steal credit for something he didn’t earn. And let’s especially make sure that the movement of movements is getting the credit it deserves. We’re heading into some very rough years ahead, and people need to be reminded of their power. As formidable as our opposition is, when we come together across issue areas and geographic borders, we have more power. When we have each others’ backs, we can still win. As for the future of trade policy, even if we’re able to ensure that President Trump keeps his campaign promises and doesn’t dust off the TPP in years to come, and even if we’re able to convince him to abandon the TPP-like Transatlantic Trade and Investment Partnership (TTIP), Trade in Services Agreement (TiSA) and U.S.-China Bilateral Investment Treaty, his views on what should come next are clearly in no way aligned with our own. Trump’s vision of internationalism is not one of human rights, worker rights, sustainability and improving standards of living. The President-elect is a man who, among other things, thinks that workers are overpaid, is hostile to unions, denies climate science and embraces authoritarian regimes. We’ve all got a lot of work to do.